Meet our team of awesome outlaws! ​A jack of all trades in her craft and the Owner here at outlaw barbershop and salon. 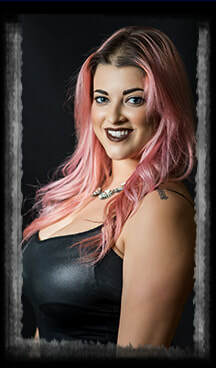 Gina has a license in cosmetology and barbering as well as a certificate for bridal and special effects makeup!she specializes in men’s grooming from hot towel shaves to any style haircut, waxing facials and color. Also specializing in women’s makeup updos and extensions you can book her for your next special day or big event. ​Some call her Mandy! She's a valley raised, Harley lovin’, passionate hairdresser. She's been a cosmetologist for 8 years, and has been an Outlaw for 2 1/2 years. Hair is her passion, seeing the smiles on the clients face after a service is what makes her heart happy. She does men, women, and children’s hair. However she specializes in styling/blowdries, creative color, and Keratin smoothing treatments. For a good laugh and great hair.. come have a seat in her chair! Doing hair is her passion and she loves every aspect of it. She knew she would be a hairstylist at a very young age, She always enjoyed doing everyone's hair as a child. Natasha would even secretly give her short haired dog "haircuts" at the age of five. She loves seeing your transformation from when you first sit down to when you walk out the door. Fun vibrant colors are a specialty of hers, along with men's grooming. ​Krystal is a fun loving California girl who loves music, art, and surrounding herself with her friends and family. Her love for hair began at a young age watching her mom and aunt doing hair in the kitchen. 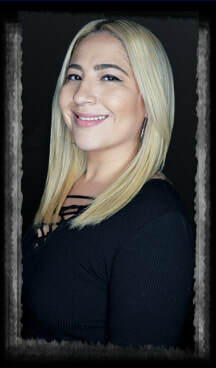 She has been professionally doing hair for 12 years and is proficient in Cuts, Colors, Color Corrections, Upstyles and Extensions. What she loves most about doing hair is the ability to make someone feel special and look amazing!